There’s no better feeling than a client saying they loved what you did – and they want to do it all over again. But that doesn’t mean you’ve peaked – it’s just the start. In December 2016, OMD EMEA approached Inskin to run a multi-market campaign in the Netherlands and Luxemburg for car brand Infiniti, across desktop, tablet and smartphone. With assets from the creative agency, the results were strong – 73.5% viewability, 48 seconds in-view time, a 1% CTR, and strong ad-recall. Eye-tracking analysis with Sticky showed a 100% seen rate, strong visual engagement on initial load with users responding to the header animation and also on the lefthand sidebar on scroll. Additional brand metric data showed uplift in all areas, notably with ad recall showing well above the benchmarked industry average. The results pleased Infiniti, and we all marked the campaign a success. When Infiniti returned in 2017 with the same assets – but adding the UK, Germany, France and Belgium to the mix – the easy answer was to replicate the previous campaign and its success with minimal effort. But Inskin wanted to offer more. More engagement, more impact, more of the creative vision that ekes maximum value from every impression. 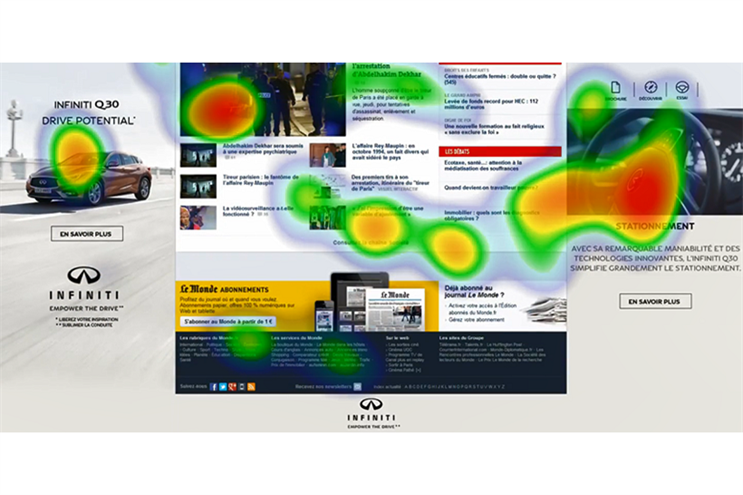 Using the analysis of the first campaign and applying insights from numerous eye-tracking studies, the team sourced images directly from Infiniti’s website and ebrochure. They proposed a new design with Inskin's 'Superwide' treatment, which maximises impact with its responsive full-width canvas. There’s an Inskin saying: "The party’s in the sidebars." As well as the focus on the header, we consistently see repeated visual attention down the sides. The sides tend to be in-view for longer on the strong editorial sites that make up Inskin's mix of premium publisher partners. Campaign messaging and CTAs scroll the sidebars with the user on Inskin formats – we realised that that we could build on 2016's campaign to make even more of the creative potential of the space. So, we adapted the creative and introduced some key features to deliver an aesthetically powerful campaign offering better potential for user engagement with product and brand. Infiniti trusted us on the new design. We collaborated closely to optimise image placement and copy in order to drive home strategic messaging in the cross-market campaign… and it paid off. The second campaign delivered high viewability across the markets involved, consistent with local viewability trends, ranging from 70.2% in France (where Moat Q2 2017 benchmarks put the viewability average at 54.7%) to typically high rates in the UK and Germany, at 87.9% and 90.0% respectively. Eye tracking analysis on the second campaign showed that it also achieved a 100% seen rate and captured close to six seconds of visual engagement time, a 2.6 second increase on the visual engagement from the previous campaign. The visual engagement registered in the scrolling sidebars contributed to a stellar brand identification result, measured in a brand uplift study undertaken with research partners Research Now: nearly three-quarters of respondents correctly identified Infiniti following exposure, and deeper analysis showed that 70% of respondents visually engaged with the logos specifically, leading to a significant increase in brand awareness. You cannot overestimate the power of distinctive assets that are easily recognisable, appealing and suitable for the brand. Inskin's refinement of the creative drove uplifts in favourability, purchase intent and likelihood to recommend, as well as increased message association and agreement with relevant brand perceptions. The increase in awareness not only increased interest but also helped to differentiate Infiniti from competitors – this is particularly important in the congested automotive sector. 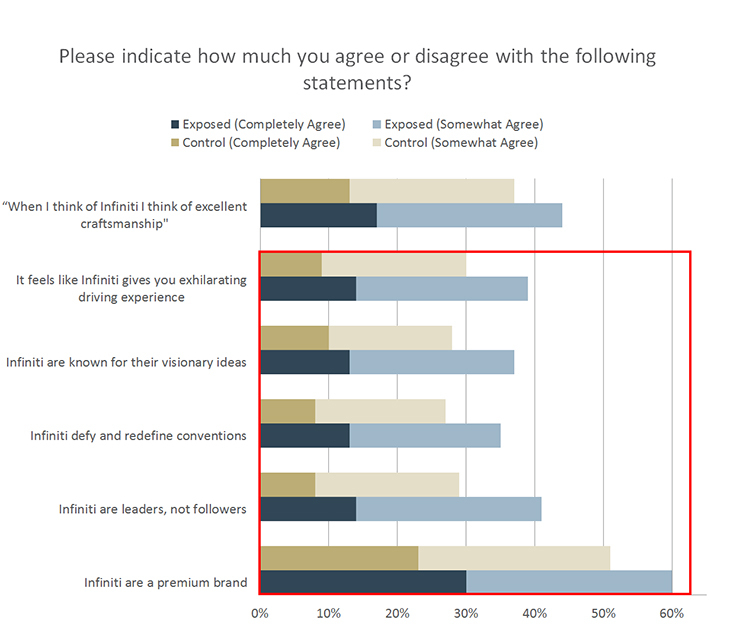 The brand research respondent pool mentioned 48 car brands: while Infiniti was in 38th place in the control group, they were the 8th most-mentioned brand in the exposed group. Using creative insights to drive effectiveness is an obsession at Inskin. It's incredibly satisfying to see that focus pay off, driving awareness in a way that aligns with Infiniti's brand goals. Infiniti’s marketing director Christophe Bouiller praised OMD EMEA and Inskin’s close partnership: "It’s refreshing to work with a partner who is as invested in the success of our campaigns as we are. The additional effort to work collaboratively and maximise value from creative execution and placement was well worth it." Exploit the creative space, without being intrusive. Inskin’s responsive ‘Superwide’ format has a large header and uses the entire width of the screen but never interrupts content consumption. Fill the sidebar spot. So many creatives have a great header but neglect the sidebars, which attract a lot of visual attention. The ‘Evolve’ feature enables multiple campaign messages to be delivered in sequence down the sidebars as users scroll. Optimise logo placement. It needs to be impactful and remain in view to drive brand recall – you can include the logo in the header and also in the sidebars on scroll. Provide opportunities for deeper product engagement. Large product imagery in the header with interactive hotspots encourages user engagement and delivers more information within the format.